On May 9, 1887, “Buffalo Bill’s Wild West”, a wildly popular, circus-like performance of life in the Old West, opened in London, England, with Queen Victoria in attendance. Despite the cartoonish nature of the stage show, "Buffalo" Bill Cody was actually a strong supporter of Native American rights. "Buffalo Bill’s Wild West" had already enjoyed years of success touring venues across the United States. The show featured Pony Express relay races, sharpshooting, Native Americans in costume, and cowboys performing rope tricks and daredevil horseback riding. The most extravagant and popular parts of the show were elaborately choreographed fights and staged attacks by Native Americans on forts or settlers’ cabins. Some of the celebrities who participated in "Buffalo Bill’s Wild West" include sharpshooter Annie Oakley, Lakota leader Sitting Bull, and frontierswoman Calamity Jane. 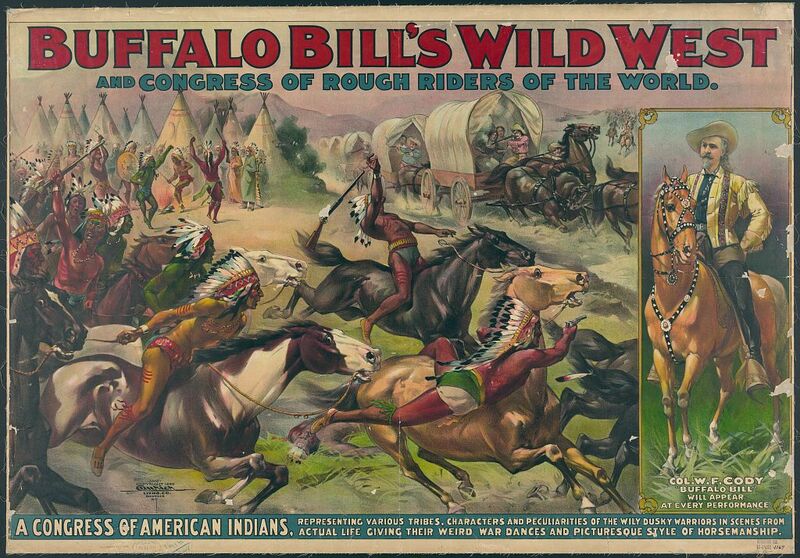 "Buffalo Bill’s Wild West" was wildly popular. Queen Victoria herself attended two performances, and the show traveled throughout Europe, Asia, and North America. In fact, the show eventually included “rough riders” from all over the world. Costumed Mongolians, gauchos, Arabs, vaqueros, and Cossacks joined American cowboys in demonstrating their equestrian skill. large mammal native to North America. Also called American buffalo. to plan and direct the movements of a dance. people and culture native to western Russia, Georgia, and Ukraine. person who herds cattle on a ranch, usually on a horse. having to do with horses. lavish production, often humorous or whimsical, with elaborate costumes and staging. traditional short story that usually has a moral lesson. military outpost, area, or set of buildings. largely unpopulated area that is slowly being opened up for settlement. people and culture of seven Sioux tribes native to the Great Plains. (1860-1861) mail route between Missouri and California. type of team racing where athletes compete in sequence. Also called a relay race. person who serves in a military. (1850-1900) western part of the United States, before and during the establishment of stable government.